Mominoki is one of the premier hotels in Hakuba, noted for its luxuriousness and location, directly at the base of the mountain. Mominoki is a very prestigious property and caters to those who want a high standard of accommodation and service. The hotel has a beautiful lobby with open fire place and lounge area to relax in and take in the mountains. 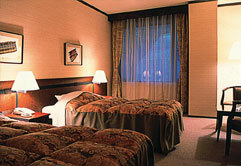 The interior of the hotel has been furnished superbly and provides customers with complete comfort and elegance. Mominoki offers its guests a very high standard of accommodation, with spacious, comfortable rooms that cater towards those who want just a little more than a room to relax in. Most of the rooms enjoy great views of the surrounding mountains and alpine vistas. Guests have the opportunity to choose between two restaurants and the food can only be described as being excellent, with both buffet and a la Carte styles and with a wide selection of international wines to choose from. Highly recommended.